Did your child come home from school with Sharpie permanent marker on their new shirt? Guess what? Permanent marker is not impossible to remove! To get started with this DIY cleaning tip, you will need white paper towels, a clean working surface, and rubbing alcohol or hand sanitizer. I prefer to use hand sanitizer (non-fragrance) because I find it is easier to work into the fabric. The trick is to NOT wash the shirt before you do this. If you do, the stain will be set in the fabric and you will have no luck getting it out! It may take a couple of tries but eventually the color will lift right out! Tagged: Laundry, Permanent Marker, Rubbing Alcohol, Paper Towels, Hand Sanitizer, Sharpie Stain, Stubborn Stains, Ink Stains, D.I.Y. 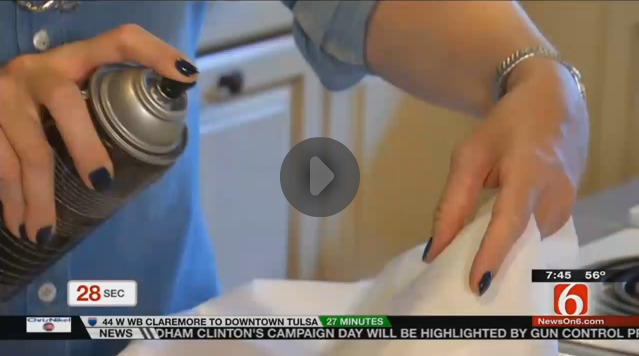 Showed News on 6 this week that club soda may not always do the trick for stubborn stains. Especially when it comes to permanent marker and ballpoint pins getting on your clothing (or children! ), it doesn't have to be a lost cause. Grab a couple of items you have in your bathroom, find a clean cloth and get ready to be amazed!